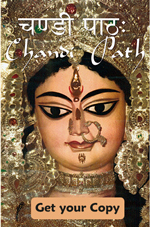 This is an Online Chandi Path Course given in March of 2014. The Chandi Path is a fundamental authoritative text of the Tantras and can only be learned from a qualified Guru. This online video course offers a rare opportunity to learn from two qualified Gurus – Shree Maa and Swamiji – who individually offer unique interpretations of this ancient text. If mastered and practiced, the Chandi Path will change the way we perceive ourselves and the world around us. Strive to make the Goddess the sum and substance of your life. Watch, listen, and learn from each discourse day by day. After each discourse we open the forum to our online viewers for a Question and Answer session directly with Shree Maa and Swamiji. In this class Swamiji introduces the Chandi Path. He explains the purpose of reciting the Chandi Path as well as its origins. This class is a must listen for anyone who recites the Durga Saptashati. In this class Swamiji explains the table of contents of the Chandi Path, giving a description of the various chapters and stotrams found within. He then reads the translation of the introductory mantras for worship. In this class Swamiji explains the remaining introductory mantras. He then translates the Sapta Sloki Durga (also called Durga Saptashloki), the Seven Verses that Express the Essence of She Who Relieves All Difficulties, and the 108 Names of Durga. In this class Swamiji discusses the mantras that remove the curses, including the Sapodhara mantras and the Brahmadi Sapa Vimochana. He explains the inner meaning of the curses and the mantras which remove them in great depth. In this class Swamiji discusses the Devya Kavacham, the Armor of the Goddess, and answers many questions from devotees about the Stotram. In this class Swamiji explains the Argala Stotram, the Praise Which Unfastens the Bolt. With this stotram we purify our intentions and take one step closer to entering the secret of the Goddess. In this class Swamiji discusses the Kilakam, the Praise that Removes the Pin. He also explains the Vedoktam and Tantroktam Ratri Suktams, which praise the Goddess as the Night of Duality. In this class Swamiji explains the Devyatharvashirsham, the Highest Meaning of the Goddess. He describes the beautiful philosophy of Shri Vidya, as well as explaining the coded or hidden forms of Navarna and Kadi mantras found in the Stotram. In this class Swamiji explains the Navarna Viddhi, the System of Worship with the Nine Lettered Mantra. He also reviews and answers many questions from devotees on a wide range of spiritual topics. In this class Swamiji begins explaining the story of Chapter 1 of the Chandi Path. Swamiji speaks on great length about each verse and shows us how the Chandi is the story of our own lives. Click here to Learn More about the Yugas and Manvantaras, which Swamiji discusses in Class 10. In this class Swamiji continues his discussion of Chapter One of the Chandi Path. He describes the aspects of Mahamaya, the Great Measurement of Consciousness, and the story of the slaying of Too Much and Too Little. In this class Swamiji discusses Chapter Two of the Chandi Path. All of the Gods had been kicked out of Heaven by the Great Ego and offered their collective lights to manifest the form of the Divine Mother. Swamiji explains how we can practically understand this chapter and apply its wisdom to our own lives. In this class Swamiji continues the discussion of Chapter Two of the Chandi Path. Swamiji explains the various generals in the army of the Ego who come to do battle with the Goddess. In this class Swamiji discusses Chapter Three of the Chandi Path, in which the Divine Mother slays the Ego and his army of thoughts. As this chapter is short, the class also includes a long Q&A on related topics. In this class Swamiji explains Chapter Four of the Chandi Path. In this chapter the Gods, having been freed from the rule of the Great Ego, sing a song of praise for the Goddess. In this class Swamiji begins to explain Chapter Five of the Chandi Path. In this chapter the Gods pray to the Goddess to free them from the two demons Self-Conceit and Self-Deprecation. In this class Swamiji continues the explanations of Chapter Five of the Chandi Path. In these verses the ambassador of Self-Conceit, named “He Who Appears To Be a Friend,” speaks with the Goddess. In this class Swamiji discusses Chapter Six and Seven of the Chandi Path. Chapter Six is the slaying of Sinful Eyes and Chapter Seven is the slaying of Passion and Anger. In this class Swamiji discusses Chapter Eight of the Chandi Path, the slaying of Raktabija, the Seed of Desire. Click Here to Learn Shree Maa’s Indispensable Wisdom on How to Defeat these Asuras! In this class Swamiji explains Chapter Nine of the Chandi Path, the Slaying of Self-Deprecation. He also answers many questions from devotees related to the chapter and spiritual life in general. In this class Swamiji discusses Chapter 10 of the Chandi Path, the slaying of Self Conceit. In this class Swamiji explains the eleventh chapter of the Chandi Path, in which the Gods sing the Narayani Stuti in praise of the Goddess. In this class Swamiji discusses Chapter 12 of the Chandi Path, which explains the fruits of reciting and listening to the Chandi. In this class Swamiji discusses Chapter 13 of the Chandi Path, in which the Goddess, being pleased by our worship, tells us to ask for a boon. In this class Swamiji explains the Sapodhara Mantras and the Navarni Vidhi, which come at the end of the Chandi Path. In this class Swamiji discusses the Rig Vedoktam Devi Suktam, the Vedic Praise of the Goddess. In this class Swamiji explains the Tantroktam Devi Suktam, The Tantic Praise of the Goddess. He gives illuminating explanations for many of the verses. In this class Swamiji explains the Pradhanikam Rahasyam, the Most Preeminent Secret. This Rahasyam begins the description of the Cosmic Altar and the origins of existence. In this class Swamiji explains the Vaikritikam Rahasyam, the Modified Secret. This Rahasyam explains the basis for the Cosmic Puja and the Cosmic Altar in the Devi Mandir. In this class Swamiji explains the Murti Rahasyam, the Secret of the Manifestations. This secret explains the forms of the Goddess as Nanda, Raktadantika, Shakambhari and Bhramari. In this class Swamiji explains the prayers for forgiveness in the Kshama Prarthana and Devyaparadha Kshamapana Stotram. He also discuses Durga Dwatrisannama Mala, the 32 Names of Durga. In this class Swamiji explains the Siddha Kunjika Stotram, the Key to Perfection. In this class Swamiji discusses the Chandi Maa Ki Arati, Devi Mayi, Bhagavati Stuti and the Pranam Mantras. In this class Swamiji discusses the Chandi Path Phal Shruti from the Varahi Tantra. It explains the various benefits of chanting the Chandi Path one or more times. In this class Shree Maa and Swamiji begin reciting the Chandi Path in Sanskrit. They chant from the Devata Pranam through the Navarni Vidhi. In this class Shree Maa and Swamiji continue reciting the Chandi Path. They chant from the first chapter through the fourth chapter. In this class Shree Maa and Swamiji recite the third episode of the Chandi Path, which includes chapters 5 through 13. In this class Shree Maa and Swamiji complete the recitation of the Chandi Path with the mantras and stotrams following the 13 chapters.